LAS VEGAS – Sept. 13, 2017 – Shelby American Inc.,has reintroduced its popular Shelby Raptor, beginning with a limited number of2018 model year trucks that will be available through its North American dealers. 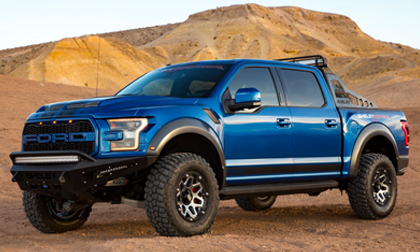 With an incredible 610+ foot pounds of torque, the super truck isbased on the newest generation Ford F-150 Raptor. Only 500 total 2018 Shelby Raptors will be available through the dealer network. Introduced for the 2016 model year, F-150 Raptor is a major departure from the last incarnation of the truck. The stock 3.5-liter twin-turbo V-6 makes 450 horsepower and 510 foot pounds of torque; it is paired with a 10-speed automatic transmission. The base truck comes with standard all-wheel drive, which features a locking center differential and an auto-shift to the rear wheels depending on the chosen drive mode. The Shelby Raptor has 525+ horsepower and an incredible 610+ foot pounds of torque. Shelby American also installs a new two stage shock system, bigger wheels and tires, upgraded interior and handsome exterior elements. The result is a stylish, custom appearance backed up with serious off-road credentials at an estimated MSRP of US$117,460, including the truck (average Raptor price is $68,165). Those with a 2017 model Raptor can send it to Shelby via a dealer for conversion at $49,295. Now in production, the Shelby Raptor will be available nationwide with each truck registered in the official Shelby Registry. For more information about Shelby American and the company’s vehicle line, visit www.Shelby.com.